The best part? 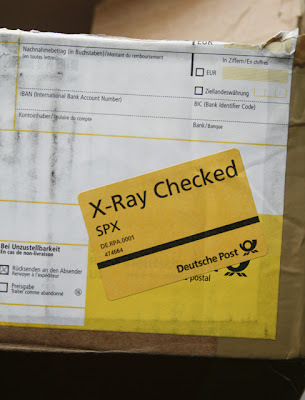 The package had been x-rayed in Germany before it got here. I can only imagine what they thought when they saw what was inside! Sunday Simulacra... allow me to shed a little light on the subject this week. 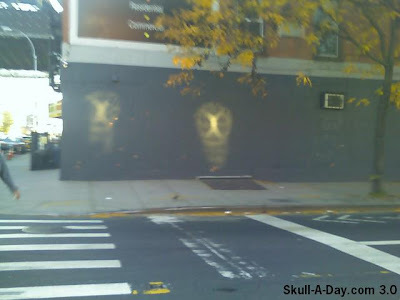 The next two skull lights are sent in by different fans of an odd occurrence that is happening around Brooklyn, NY. Thank you all for submitting these enlightening pictures. Sean, that is a great shot and I wonder if there is a deeper story to tell from the area where the picture was taken. Kurt and Ross, It looks like NYC has a new place to go if one wants to see a light show. I am curious if what you are both seeing is a result of the same building and the same apparatus on the utility pole or just a weird coincidence. Since you are in NYC you can always consult here for help and let us know. 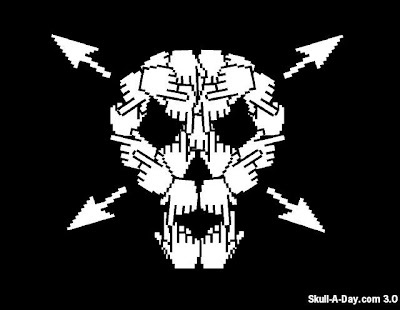 Until next time, this is Editor C, and I'll leave our skull light on for you. 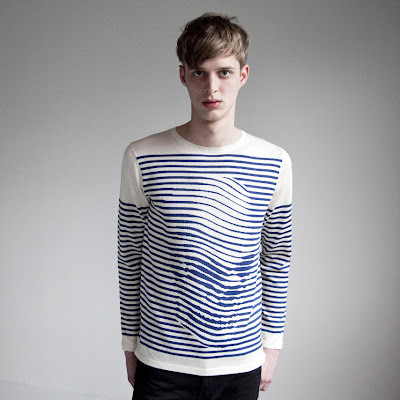 Sibling London is finally selling their Breton style sweaters featuring my Skulledelic art in their online store! 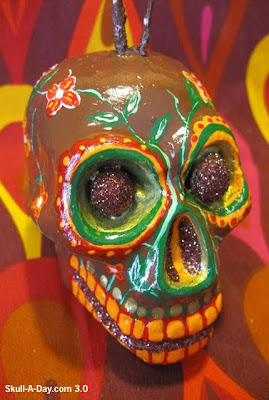 Shayna, from the endlessly talented state of Virginia, brings us her hand painted Day of the Dead skull that is available at her Already Dead Etsy store (which happens to be filled with all kinds of cool skeletal related items). 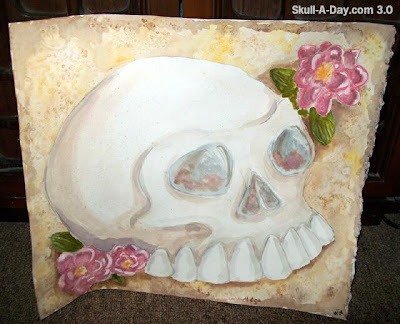 I like the warm earth tones you used and the bright flowers that decorate this skull. It reminds me that what returns to the Earth shall someday be reborn. Thanks, Shayna! As the project neared its end, I started doing a lot more collaborative skulls. In this case I'd been talking with my friends at my favorite local sushi & tater tot restaurant about the project for a while and they kindly offered to let me come in and play in the kitchen with their ingredients! Check out the original post to see the skulls that my friends who were working there made while I was making mine. Sadly this hasn't become a regular item on the menu. 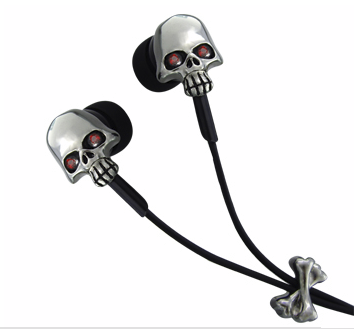 Congratulations to M and John who were the two randomly selected winners of the Clooci Skull Headphones giveaway! Thanks again to everyone for participating and creating such an incredible reading list with your suggestions. 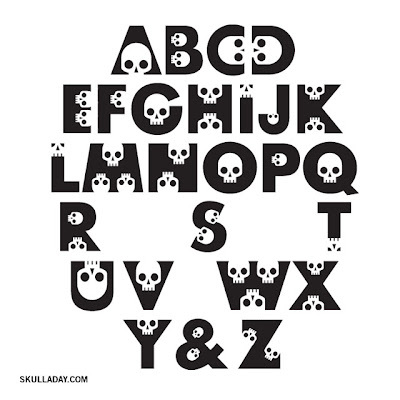 I love that Skull-A-Day fans are as into books as I am! And hey, even if you didn't win you can still buy a pair of Clooci's nifty headphones HERE. 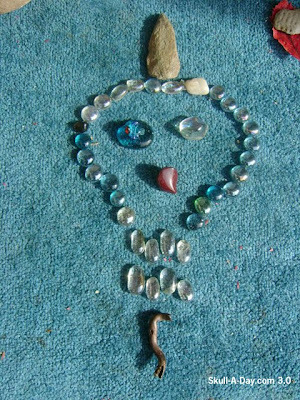 Shelley Sidle-Owens and her main man Jimi Germ are back again with this simple yet enchanting set of stones and rocks. 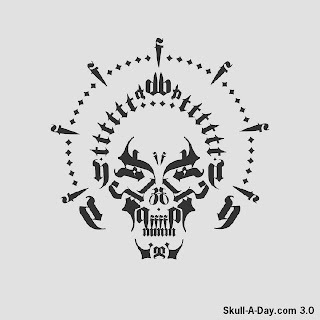 This skull has some real stones for showing up with a mohawk. A good reminder to be true to yourself and the look you choose. 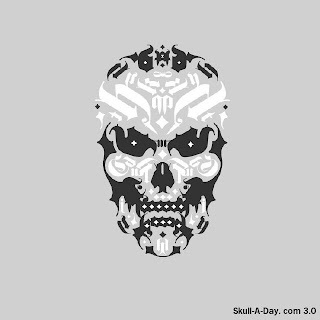 We embrace all genres of skulls here at Skull-A-Day. Everything from the dark depths of the macabre to the shining remembrances of skulls once living. Thanks, Shelley and Jimi! 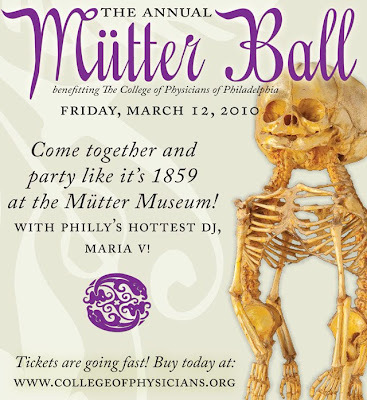 Come together and party like it’s 1859 at the world famous Mütter Museum on Friday, March 12th for 2010 Annual Mütter Ball, benefitting The College of Physicians of Philadelphia! The evening will be a Victorian-inspired affair, complete with authentic 19th-century punches and a VIP Absinthe Lounge! The evening will features the music of one of Philly’s hottest DJs, Maria V! And, of course, the Mutter Museum will be open for free visitation! The Mütter Ball is a must for fans of all things Steampunk, Tim Burton and Edward Gorey! Guests are encouraged to come decked out in their best Victorian-inspired garb! Tickets are going fast, buy today at: http://mutterball.eventbrite.com/! And this week only they are even offering 10% off admission prices to Skull-A-Day readers if you use the discount code “mutter2010"! I'll definitely be going, so I hope to see you there! Tickets and details are HERE. 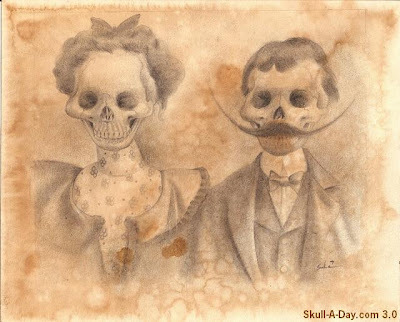 An old friend Sake returns with a pair of skully drawings. Two masterpieces in a classic sense. It is great to see your impressive work. I really like how you captured the wear of actual vintage photography in your work. It makes me think that the subjects in the photo are aging as well as the photos themselves. Thank you for submitting your work and continuing to be a fan. 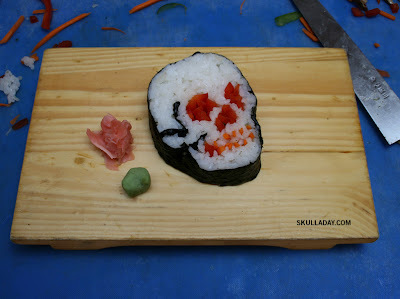 ** You can see more of Sake’s skull work here and here. This little light of mine, I'm gonna let it shine all over the internet. 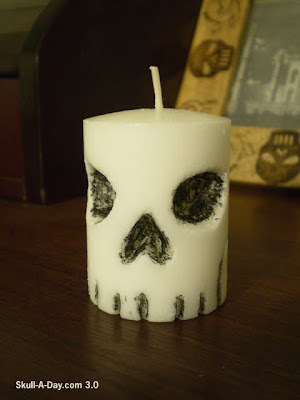 If you have never taken the time to relax with a skull scented candle then maybe today needs to be that day. Wait, did I just say "skull scented"? 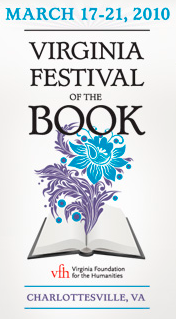 I'm delighted to announce that I will be taking part in this year's Virginia Festival of The Book! The five day event in Charlottesville starts March 17th and features tons of opportunities to hear from a wide range of authors from all over the state of Virginia. 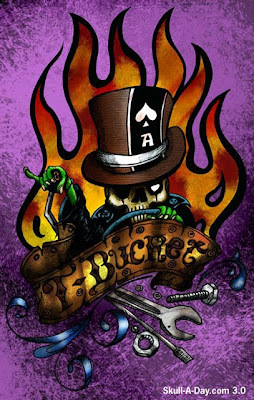 I will be doing a talk called "Visual Literacy" with steampunk author Nick Valentino at 8pm on Wednesday, March 17th at Random Row books. The event is Free and should be a lot of fun. Please stop by and say hi if you're in the area. More details can be found HERE. Valerie Pierce knows that doing something you love is best shared with friends. 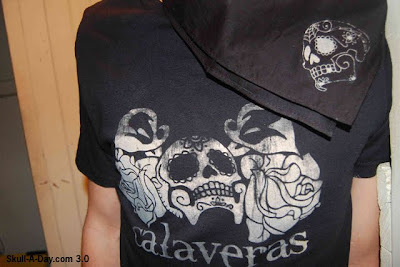 She writes, "Recently I have started a screen printing company with a friend of mine called Calaveras Apparel that is focused around Day of the Dead, skulls, fine art, and tattoo work. I designed the logo by hand, drawing the image and creating the font used for the company name, then we hand screen printed it on a few t-shirts." I really like the old school vintage look of your shirts. As a matter of fact, all of the stuff in your etsy store is great. I'm such a sucker for handmade goods. Thanks, Valerie(and thank your friend, too)! This week’s offering is Courtesy of a Cat. I thought a cherry pie today was just too predictable. I wish I could tell you, I was trying to collect some of the World’s Most Expensive Coffee, but sadly no I am not getting rich with this. The responsibility for today’s inspiration goes to a neighbor who is away leaving me to cat sit. I told them I wouldn't mind, but needing to clean the litter box would be the death of me. I can clearly tell you the moment when I had my doubts about doing this one. However, if you don't have a cat or even if you do, here is a more palatable way in which you can have fun replicating this one at home. As for this one's final location... sometimes good art ends up in the dumpster. BALDEK from France said: "No comment, no link (but a lot of pointers!)" This is wonderful work. Taking an object that many of us see many times a day and never think about, and turning it into a piece of art that displays so much movement is an incredible feat. My favorite part of the whole piece is the creation of the teeth using a natural source. Thank you for submitting your work for us to share. 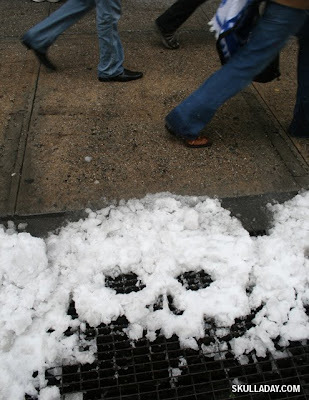 It seems that Mother Nature is doing her fair share of the work to create the skull simulacrum that all of our keen eyed skull hunters are finding. These tree skulls are just some of the ways that she is reminding us that someday our skulls will return to the Earth. Morté (aka Matt) found the first of today's trees. "I took this picture this last summer at the Kanawha State Forest in WV on one of their nature trails. 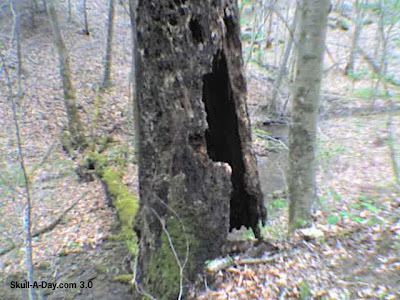 I see a large skull in the tree trunk, but I did not notice it when I took the picture, just after I got it on my phone and looked at it." Christopher had some help from some canine friends with this one. "I took the attached picture while hiking with my cousin's poodles in a park in Toronto, Canada. 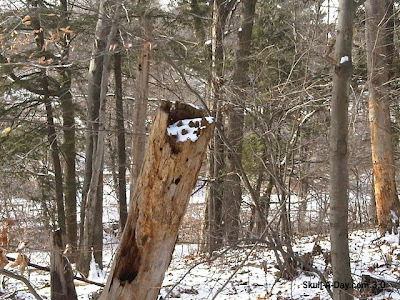 I immediately thought of Skull-A-Day when I saw this broken tree in the woods." And Chelsea Park found this stumperrific skull hiding in a tree on the big island of Hawaii, on the way to the Lagoon at Kiholo Bay. Thanks to everyone for getting out there and staying active with physical activity and for keeping your skull eyes open. 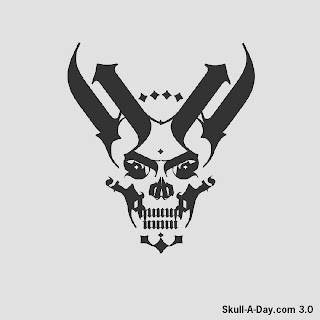 If you are lucky enough to find one of Mother Nature's hidden skulls then feel free to submit them through our submissions page. Alexandre Machado is a designer from Brazil who creates all kinds of great illustrations. 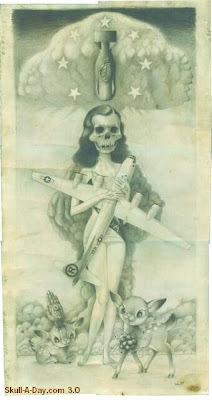 This is just one of the many skulls he's done. I'm sure that this will be a hit with any gearheads out there. Thanks for power shifting it over to us, Alexandre! 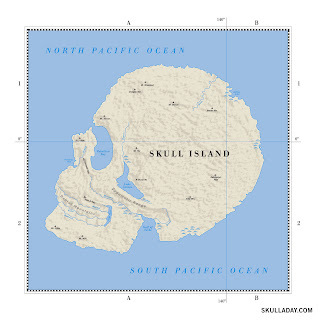 I love maps, so it seemed an obvious choice to make one of a Skull Island. Of course any good map needs place names on it. 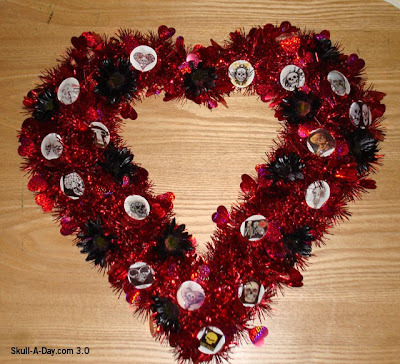 I decided to made things in tribute to some of my dedicated friends, fans, and fellow bloggers. You might recognize a few names on there, though it seems like it might be time to make an updated version with some of my new pals. Maybe a print of this is in order, would you be interested in one? I am not so sure if this could “Stop a bullet cold”, but it certainly could “Make the Axis fall.” I am very impressed with your work. The details and coloration are exquisite on this. I am glad you included a picture of it in use, it makes this work that much more tangible to the viewer. Thank you for submitting your work to share. 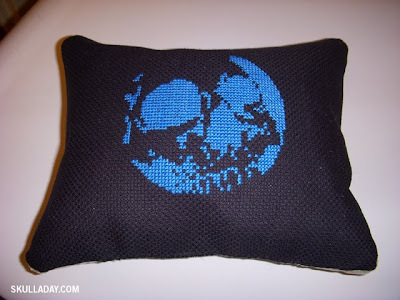 Christina did an excellent job making my Cross-Stitch pattern into a pillow and she says she plans to make more! 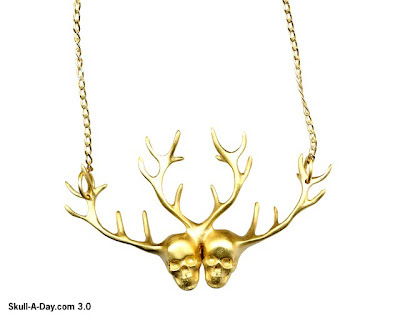 London jewelry designer Gisèle Ganne graces our blog today with her exquisite skull designs. Her first piece is a beautiful twin stag skull that is a true trophy rack. And this second piece is just something that defies definition. A terrific shoulder piece that would make any head turn. Especially if you were dancing face to face with the skulls of the Black Widow. If you like these then you will love all of her other fine jewelry at her website. Some of my favorites are the army men rings. Thanks for sharing your wonderful jewelry with all of us, Gisèle. Thank you for submitting your work. At first look one may not recognize this as watercolor. 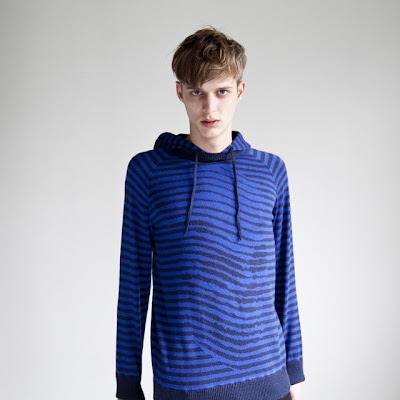 You have such a deep dimension of colors that I thought it was another medium. 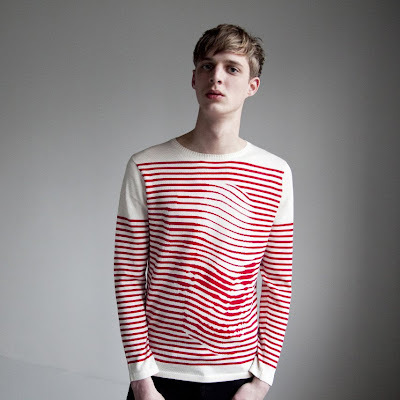 This is wonderful work and I like the story behind it's creation, thanks for pointing us there. 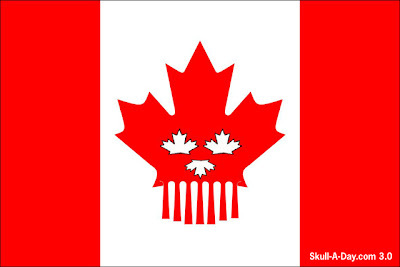 I may be a day late for National Flag of Canada Day, but that won't stop me from paying homage to my neighbor to the North (or as some people may call it- America's hat). O Canada! You are a great country. Whether you're doing a great job of hosting the Olympics, or just circling the pond for a friendly game of hockey, you truly know how to spread brotherhood and friendship. 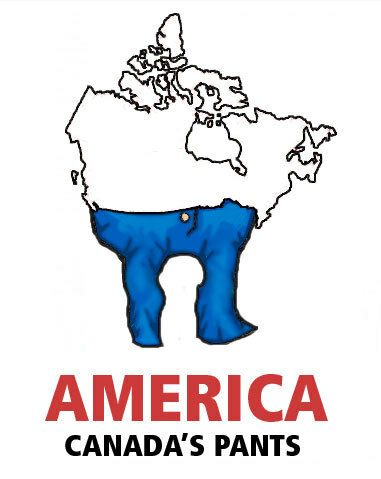 Thanks for being so understanding of your spoiled neighbors to the South(or as some call us- Canada's pants). In all seriousness, I mean no disrespect to the country of Canada in general. It's a really nice place, eh. These two paintings come from Michael Aaron Casares. He tells us, "They are ultraviolet transparency paintings. I use acrylic and glass. They glow in the black light." These are some totally trippy paintings. The pics look good, but I can imagine that the real thing under black light is the best. Thanks for the flashback, Michael! This week’s offering is a Celebration Custom. 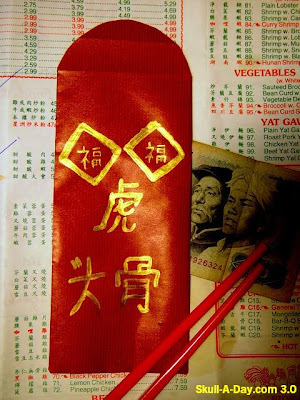 Happy Chinese New Year everyone, during the celebration it is customary to give red envelops that contain money as a way to insure luck in the new year. Wishing you all good fortune this year. The new year began yesterday and it is now the second day, traditionally today is the day in which one's ancestors are remembered. 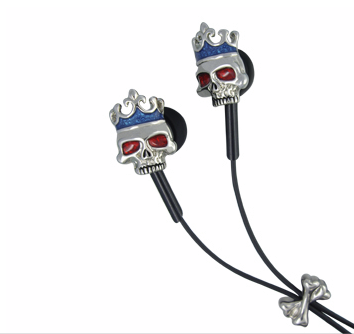 The fine folks at Clooci have kindly offered to give away a pair of their fun skull headphones to two lucky Skull-A-Day readers! Everyone is welcome to enter, but please note that if you're out of the US you will need to pay for shipping. You have until just Midnight Eastern Time February 22nd to enter so don't delay! And of course you don't have to wait til the end of the contest to get some nifty headphones from Clooci, you can see them all HERE! 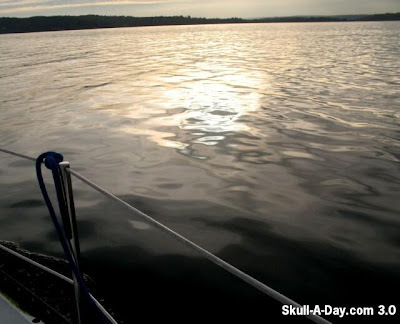 Congratulations to theNWelcamino who was the randomly chosen winner of the Etched Skull-A-Day Glass Giveaway! Thanks again to everyone for participating, don't forget you can still get other glasses, including custom designs from Tatman HERE. Stay tuned for another giveaway starting tomorrow! 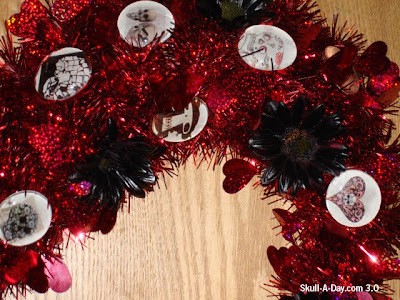 Amanda Hicks says, "I created a Valentine's day wreath to show my love of skulls. 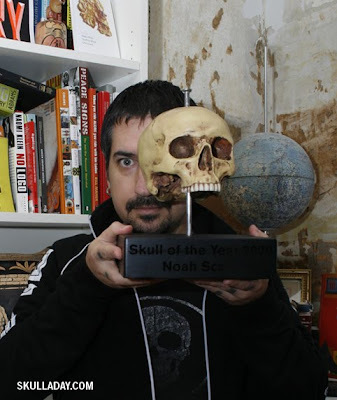 Some of the images are from you Noah, and some are from Rich's flicker page, which I saw posted on Skull-a-Day. 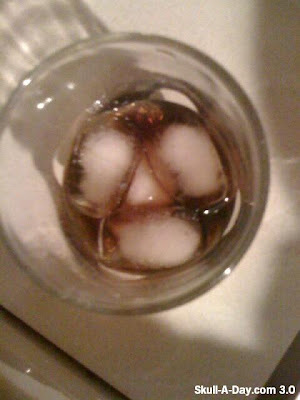 I asked Rich if I could use and post his images, and he said it was fine. I found some others by just surfing the net. I made the images into beads by glazing them onto flat bottom glass beads, then attached them to the frame. I also added the black flowers to make it pop a little more. I hope you like it. Happy Valentine's Day." From Red Hill, PA to Russia with love, and that love is simulacra. Thank you all for submitting your finds.